Those of us who have never been much tempted by theories of “progress” in the arts are particularly pleased when we find it. When I was a young student learning organ works of Messiaen, and even more when I went on to be a historically- and analytically-minded musicology student, I never dreamed that Carnegie Hall would one day captivate me with a half day devoted to a view of Messiaen that was consonant with what I was then trying to learn. Carnegie Hall! It represented all that was stiflingly establishmentarian to youngsters like me. I won’t insert here examples of the artistic blindness that we then attributed to such institutions, but the Weathermen and Black Panthers of the day had nothing on us for violence of expression — at least verbally. And lest it be felt that I’m exaggerating the kind of neglect even so famous a composer as Messiaen saw in favor of a constant repetition of the same repertory favorites, one of the attractions of today was what the Hall itself billed as the Carnegie Hall premiere of Visions de l’Amen, a 65-year-old two-piano work long securely lodged in the international repertory! It is tempting to summarize here the marvels of Peter Hill’s lecture (and I hope that pieces that I will write here later will be informed by it), but suffice it to say now that he fleshed out the whole image of Messiaen as artist, husband in a rare musical partnership, and man driven by a consistent vision. The film (a clip from which can be seen here) was testimony to an awareness of vocation thrilling to contemplate. 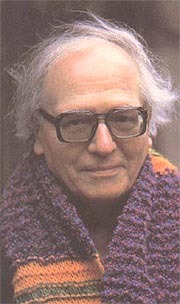 Nothing was more affecting than Messiaen’s description of the moment when he, as a ten-year-old, became conscious of himself as a being dedicated to music. The interview with Boulez was by definition magisterial, and it was a rare experience to hear the octogenarian musician talk about his youthful discovery, in his very first days in Paris during World War II, of the music and the man who would dominate his conservatory education. He spoke with an unsentimental respect, not unmixed with criticism, of his debt to his maître. But the restrained façade was broken somewhat when the interviewer confronted him with his own words spoken to an audience at the Théâtre du Chatelet on the night after Messiaen’s death. Boulez seemed surprised, and a little misty-eyed, to hear the words he had spoken in dedicating that night’s performance of Pelléas et Mélisande to the man who not only taught the work as a testament to all he believed in artistically, but who attributed to it a rôle in his survival in the prison camp: Messiaen often recalled lying in bed in the barracks reconstructing whole acts of the work in every detail of its score, from dynamics to orchestration. You may imagine that the audience in the hall was by then thoroughly prepared for the experience of the Visions de l’Amen, a piece devised to be performed by the composer and the great pianist, his wife, Yvonne Loriod. May we hope that the New York Philharmonic, for whom Olivier Messiaen composed his last work, will perform Éclairs sur l’au-delà during this centennial year?